Who would have thought that my insatiable sweet tooth could be sated? That was the case this weekend with the latest installment of the Foodiemeet series, the brainchild of two fabulous local foodies, Suresh and Andrea. Foodies gathering together to share food. All for the sole purpose of supporting food in the community. Love it. Twitter has introduced to me to so many fabulous local foodies (and global foodies too! ), and over the summer, the thought had passed my mind that it would be a great idea of local bakers to get together for some kind of charity event. Which is why I was thrilled when I received an email from Suresh two months ago asking if I would like to participate. Did I even need to be asked? There was no way I would say no. And so the planning stages began when the theme was revealed to the bakers: Escape from Toronto. And then I asked myself, “Where would I want to escape to at this very moment.” Two answers came to mind: Europe and Asia, two countries known for their culinary prowess. Italy and France. Those are the two top countries I would love to visit when I got to Europe one day. And with those two countries in mind, I bounced around some ingredient ideas: chocolate, liqueur, and chestnuts (the perfect season for them!). Put them all together and I was inspired to make Chocolate Brandied Chestnut Cupcakes with Chestnut Cream. But before I hit Europe, I’m still in my Asia phase, and nothing would thrill me more than to go back to Japan again. My whirlwind tour of Tokyo a few years back left a huge impression on me, and I would love nothing more than to travel to other cities and the countryside to enjoy some fabulous, authentic Japanese food. Hence my ode to my future Japanese trip (if I can ever afford it! ): Black Sesame with White Chocolate Wasabi Buttercream. Icing the cupcakes was another feat in itself, as it reminded me how I have zero skills in cake decorating. Also reminded me to seriously look into some cake decorating courses in the new year when I’ll hopefully have money to spend again. But finally, they were frosted and ready to head off to Foodiemeet Bakeoff. A huge thanks goes out to Catherine for lending me some cupcake boxes, and Joel, who was sweet enough to give me a ride over to Samovar Room and to lend some muscle by carrying my two boxes of cupcakes down to the car. The Room was already buzzing with bakers when we arrived, and I was immediately wowed by some of the creations I saw as they were setting up, but more on that in tomorrow’s post! 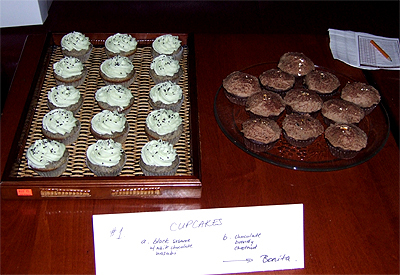 I wasn’t sure how my Black Sesame Cupcakes would be received, but as the night wore on, more people were eager to try the exotic combination and I got some great feedback from tasters (thanks!). A few people have been asking me for the recipe, which you can find below and recreate the cupcakes at home. Be sure to come back tomorrow to check out part two of my Foodiemeet Bakeoff post, where there’ll be more thoughts on event, and my recipe for the Chocolate Brandied Chestnut Cupcakes with Chestnut Cream! Preheat oven to 375°F. Line muffins tins with paper cupcake liners and set aside. In a bowl, sift together flour, baking powder and salt, and set aside. Place the toasted sesame seeds in a food processor and pulse until finely ground. Set aside. In a large bowl, cream butter and sugar with an electric mixer until light and fluffy, about 3 minutes. Add the sesame seeds and mix to combine, about 1 minute. Add the eggs, one at a time, beating after each addition. Add the vanilla and beat until combined. Add about one-third of the dry ingredients and slowly beat until just combined. Add half milk and beat. Repeat, alternating between the dry and wet ingredients, and finishing with the dry. Beat until just combined. Fill cupcake tins to three-quarters full and bake for 16 to 18 minutes, or until edges turn golden brown and a cake tester inserted into the centre comes out clean. Remove from the oven and let cool on racks. Cool completely before frosting. For the White Chocolate Wasabi Buttercream, melt the white chocolate in a double boiler. Stir until smooth. Set aside and let cool to room temperature. Sift the confectioners’ sugar into a medium bowl. Stir in the milk and vanilla and beat until sugar has dissolved. Add the butter and salt and beat until smooth. Don’t panic if the mixture looks like it’s curdling and falling apart. Just keep beating on high, and once the white chocolate is added in, it will become smooth. Stir in the cooled white chocolate and beat on high until buttercream is smooth and well incorporated. If you want a slightly more visible green tint to the buttercream, beat in a few drops of green food colouring. Refrigerate the buttercream until firm enough to frost the cupcakes, about 30 minutes. Using a large star-tip, fill a piping bag three-quarters full of buttercream and pipe onto cupcakes. 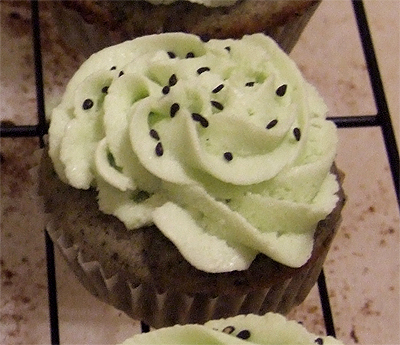 Sprinkle cupcakes with some extra black sesame as a finishing touch. Refrigerate the cupcakes until ready to serve. 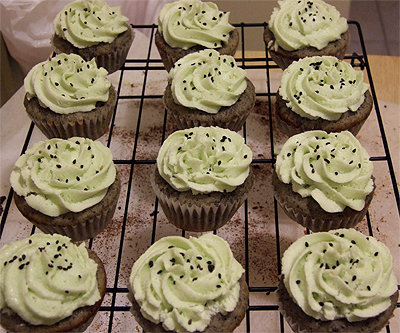 Before serving, pull cupcakes from the fridge to bring back to room temperature, about 30 minutes. Posted by Bonita at 10:15 p.m.
Sarah December 16, 2009 at 7:08 a.m. YES!! Sesame seeds + wasabi?? I would have totally bought you out there :-). Next year for me!! I cannot WAIT! God knows I'll need an excuse to make 11 kinds of cookies haha! Anonymous December 16, 2009 at 1:30 p.m.
People around the office were curious about those. Erika from The Pastry Chef At Home December 21, 2009 at 11:08 a.m.